The woods in Florida have a different kind of beauty than those up north, but it’s beautiful all the same. We are very fortunate in Southwest Florida to have a wealth of wild (OK, mostly semi-wild) places that are open to the public. Access to most of them is stupid simple: Park and walk right in. But what your experience will be like depends on how you’ve prepared and how you behave while you’re out there. The following tips will be useful here locally and pretty much anywhere you want to go. This has to be rule number one, and I see people breaking it all the time. If you want to see wildlife, you have to be quiet. When an animal hears you chattering away, tromping loudly through the brush, even (I swear I have witnessed this more than once) listening to music on your phone, guess what happens? They vamoose. You’ll be lucky to see a squirrel or dove; forget about the deer and turkeys. Of course, there are times when communication is necessary. Hand gestures are ideal. If you must speak, do so as softly as possible. Take care where you walk. Avoid stepping on branches or crunchy leaves if you can, and try to roll your feet from heel to toe. Flip-flops are loud as well. If you’re staring down at the trail ahead of you, you’re going to miss a lot. Sure, you’ll spot some things: Beetles, lizards, maybe some animal tracks. But there’s a whole bunch more that’s happening at and above eye level, and not everything will be right in front of you. Keep your head on a swivel. Scan side to side, up and down. Don’t forget that animals will sometimes freeze when they see you and move only after you pass, so look back once in a while. How can you do all this and not trip on trail debris? You’ll have to slow down. A lot. That’s a good thing — the slower you go, the more you’ll absorb. What, ya got someplace to be? When you’re always on the move, you’re going to miss details — and out here, details are everything. Hike a bit, then stop a bit. Pay attention to what’s going on. This goes along with the previous tip, but at the risk of repeating myself, slow it down and you’ll see a lot more. You’re not the patient type? It’s not really my nature, either — but being out here forces us to be patient or miss out. Trust me on this, because the truth is it’s a big part of the reason to be outdoors in the first place. Your cellphone is a useful tool, and you should look at it that way when you’re in the great outdoors. It’s not entertainment — not out here. If you have some sort of emergency, you’ll be glad to have it. However, if you spend the whole time texting with Tina about the latest Taylor Swift hit, you’re going to miss out on the wild. Put your phone on silent and ignore the outside world for a little while. Now, if you want to use your phone to enhance the trip, that’s OK. Record bird or frog sounds to identify later. Download a field guide app and use it to ID waterfowl as you spot them. Check the USF plant atlas to help determine what those wildflowers might be. Even take a selfie with that gopher tortoise. But remember, you’re here to immerse yourself in nature. Don’t let the phone eat up all your attention. It’s hard to enjoy nature’s beauty when you’ve got sand in your shoes, your legs are all scratched up from saw palmettos, and your face is sunburnt. For most people, covering up is the safest bet. This is the main reason why our parks and preserves are busier in winter — covering up in summer can be almost unbearable. The general uniform: Long sleeves, tough pants (denim is ideal), hiking shoes with socks, a wide-brimmed hat and sunglasses. To be honest, this is a case of “do as I say, not as I do.” If you run into me out there, I’m probably going to be in shorts, short sleeves (maybe layered, if it’s windy and below 60 degrees), sandals (no socks) and bare-headed. However, you should know that I grew up walking barefoot around thistles, prickly pears and sandspurs; I’m immune to poison ivy; and after 40 years in the Florida sun I tend strongly to tan instead of burn (especially in winter’s lower light levels). Unless you can say the same, I don’t recommend following my example. I like to travel light, but there are a few things even I carry out there. • A small first aid kit. • Binoculars, because many of the things you’ll want to see are just a bit too far away. • Water. I usually carry just one bottle and don’t drink it, but I also pre-hydrate (if you’re doing this, be aware of the lack of facilities in the woods and be prepared to deal with it). • A bag to collect trash. • A small LED flashlight. • A camera. This might matter less to you, but I’d rather forget my pants than my camera. Cellphone shots just won’t cut it for me. • Your cellphone, for reasons previously described in detail. Now you’re armed with a checklist of what to wear, what to bring, what to do and what to avoid doing. There are just two more decisions: Where are you going, and are you going solo? To answer the first question, check the following resources: Charlotte County: http://bit.ly/2Cwq8NG; Sarasota County: http://bit.ly/2Sgwaan; Lee County: http://bit.ly/2Q1CMYx; Florida state parks: http://bit.ly/2EL22kn. To answer the second, that’s up to you. I do both, but I’d suggest the less experienced use the buddy system. It will help you locate more cool things, as long as you can remember to keep quiet (and maybe work out a few hand signals in advance). A lot of people from the northern state think that there are no woods in Florida. That notion couldn’t be more wrong-headed. Now go play outside. Capt. 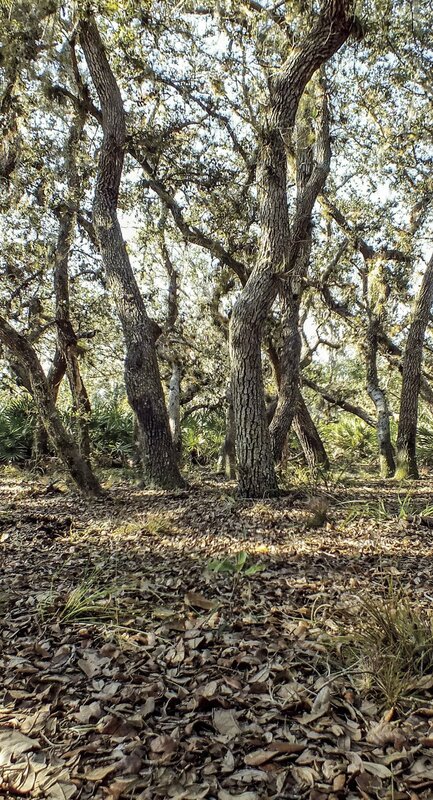 Josh Olive is a fifth-generation native Florida Cracker and a Florida Master Naturalist, and has been fascinated by all sorts of wild things and places since he was able to walk. If you have questions about living with wildlife, email him at Publisher@WaterLineWeekly.com. You can also follow him on Instagram @florida_is_wild. WaterLineWeekly.com. You can also follow him on Instagram @florida_is_wild.